Part II of our Klimaschutz series will summarize and highlight key achievements in each of the cities and major takeaways from the trip. I want to point out an added value gained from this effort beyond learning from our German partners, and that is how much was learned from each other. For the Minnesota participants, the time we had together to talk through issues and think about how we can solve them within our own political reality was an incredibly important aspect of this partnership, and will be extremely valuable as these cities work together to lead Minnesota in its effort to minimize our impact on a changing climate. People travel from all over to visit the small town of Saerbeck, Germany. With a population of just under 8,000 people, this quaint village has a big story to tell about how a small town can have a big impact. 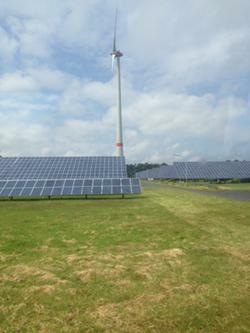 Saerbeck currently produces more than 300% of the energy it consumes from local renewable energy sources. What’s remarkable is the timeframe in which the community was able to reach this feat. 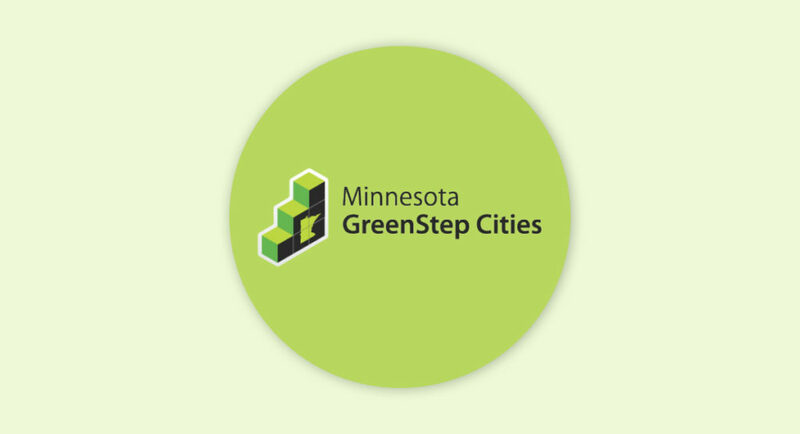 In 2009, the City set a goal to achieve 100% of its energy from local, renewable sources by 2030; it was achieved by 2014. How did they do it? If you ever get to Saerbeck, one thing you will notice as you make your way through town is that energy education is everywhere. The Energy Experience Path brings you past the school’s solar panels and the city’s transparent (literally) district heating facility, explaining how energy works and where it comes from at every opportunity. Solar panels are common on the rooftops of many homes, demonstrating strong public buy-in for clean energy independence. So in 2007, when the city purchased an unused army ammunitions depot site from the federal government, rather than developing the land for commercial or residential use, it was easy for the city make the decision to develop a Bioenergy Park. The Bioenergy Park now has seven wind turbines, two anaerobic digesters, every bunker is covered in solar panels, and it serves as a substantial source of revenue for the community. When we asked if they had the public’s support for this development, the response was that the mayor had been re-elected with over 80% of the vote. When we asked if they ran into any issues along the way, they said everything was so carefully thought out that when something came up, they were able to find a solution. Challenges were never perceived as barriers, just problems to be solved. Take Away: Educate residents. Set goals. Identify strategies to achieve those goals. Don’t let challenges be barriers. Just Do It. 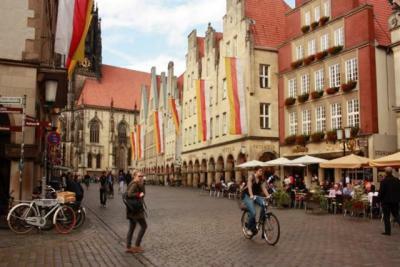 The night Germany played France in the Euro Cup was the perfect night to be in Münster – Germany’s top city for biking with about 40% of commuters choosing bikes as their primary transportation mode. As daily bikers ourselves, Professor Wilson and I could not wait to hop in the saddle. Fortunately, the hotel where we were staying offered bikes for free!! By the time the delegation’s day was over – we toured bike infrastructure, net zero student housing (which was constructed at no additional cost over traditional construction), and met with city officials – night had fallen and the soccer (fußball) game had begun. The streets were deserted and the city was ours. Here is what you should know about Münster. The city, like most European cities, is dense and was originally built to accommodate foot and horse traffic, since it was settled long before the advent of the automobile. After World War II more than 80% of the city center had been destroyed from intense bombing. City leaders had to decide how to rebuild. Despite the rising popularity of the automobile in the 1950s and 60s, the city chose to replicate what had been there before – maintaining density, character, and network of streets – which incidentally works well for biking. Perhaps most importantly, the city was once surrounded by a wall and a moat. Since the wall came down, the path it left behind has been repurposed to be a promenade, providing cyclists and pedestrians a pleasant, car-free path around the city center. Hands down my favorite part of the trip was biking the nearly deserted promenade while the rest of the city (and our delegation) watched Germany lose to France in the Euro Cup — bummer. Take Away: There is no better way to see a city than on a bicycle. If you build it, they will bike. As much as I am an advocate for increased biking facilities and better public transportation, I recognize that without fuel switching, we won’t meet our carbon reduction goals. Like Americans, Germans love their cars. BMW, Audi, Mercedes, Porsche, and even Volkswagen are kind of a big deal. So it is not surprising that they also have to think about carbon reduction for personal vehicles at scale, too. In Iserlohn, the City is piloting an e-mobility program (kind of like Drive Electric Minnesota) to make it easier for people to own and drive electric vehicles. Most EV drivers are able to charge their cars to meet its needs at their own homes. But what happens when you need an extra charge away from home? One issue is determining how to pay for the electricity. As part of this this pilot program, EV drivers are given a special power cord that is linked to their personal electric bill. When they go to charge anywhere within the city, the chargers recognize their cords and charge the drivers through their own bill. I mentioned the major German automakers above, and as far as I know, at least two of them are aggressively moving towards electrification of their vehicles – BMW and Volkswagen. BMW is currently one of the leaders in the EV market and I got to test drive one as part of the EV presentation! I am not endorsing any one vehicle over another, but the BMW is sweet. It gets up to speed fast and slows down fast – without even using the brake. Its range is over 100 miles on a single charge. Take Away: One solution doesn’t cut it. When we plan for transportation, we need to think about bikes, cars, transit, and our feet. We have to diversify our fuel options and make alternatives to personal vehicles the desirable choice. Siegen is the partner city of Duluth. It is also the city that most closely resembles the physical and industrial characteristics of any of the Minnesota communities – add the largest lake in the world and you essentially have Duluth. Siegen is an old mining town that is in the midst of reinventing itself for the changing economy. One of the biggest companies in Siegen is a steel manufacturing plant. At this plant they recycle steel into new products and in the process the plant generates a lot of heat. Right now that excess heat is exhausted out of stacks, and is essentially wasted. The city has plans to capture the heat and use it to meet thermal loads in the community. District heating is something that came up several times on our trip. Each city seemed to have some amount of district heating and were always thinking about how to add more. Touring the steel plant, it really sunk in how much waste heat goes unused. Take Away: There is a TON of opportunity to capture waste heat, we just don’t always think about it. In the same way cities think about and plan for other infrastructure, they should consider possibilities for waste heat. Bonus Take Away: Steel plants are really hot! Seriously. Going on this trip was a good reminder that there are a lot of good things happening in the world. It was exciting to watch the city leaders take in what they were seeing and reimagine what is possible in their communities. As the program moves forward, we will create a special kind of peer pressure that promotes idea-sharing and innovative thinking. We will not only learn from our German partners, but also teach them our approach to this complex challenge. At the end of the trip, we all gathered in a room for a wrap-up discussion about our reflections and what is ahead for the program. There were a lot of good ideas, and a lot of laughter. Two of the German delegation members sat-in on our meeting and observed our conversation. When we were finished, I spoke with one of them and he remarked on how amazing it was that we looked like we are having such a good time with each other and that Germans never laugh during meetings. Which made me think about how Minnesota has a strong history of collaboration despite our disagreements, and it has worked pretty well for us. Our German city partners showed us what is possible and we just have to do it; doing is believing. The worst part of ripping a Band-Aid off is the apprehension of the build-up, and if we’re going to do it, it might as well be among friends. 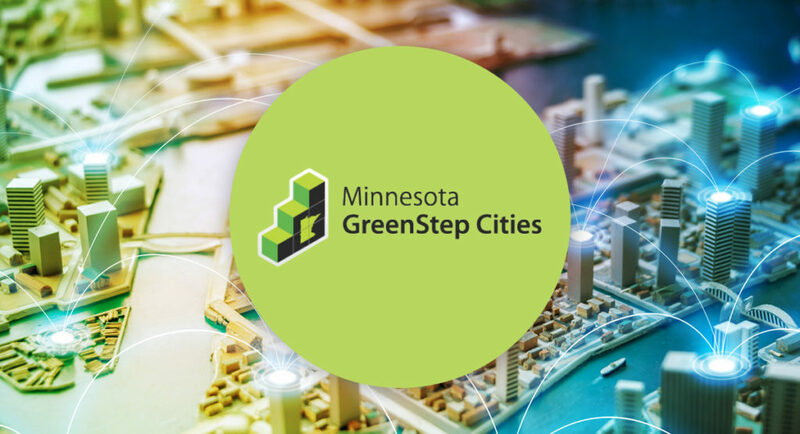 A number of Minnesotans traveled to Germany as part of Climate Smart Municipality Program to learn how various cities are tackling climate change in the State of North-Rhine Westphalia. 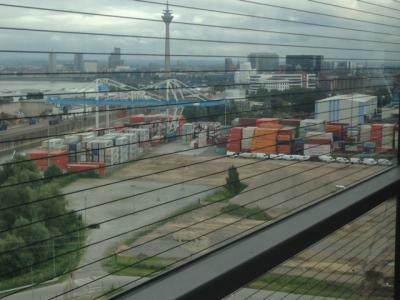 Germany has a relatively long history integrating renewable energy into its electric grid, and consequently has a lot to share about what is possible. National policy has been key to its successes, but cities are driving innovation.